President Lula is being subjected to judicial persecution that is unprecedented in Brazilian history. This persecution has a clear goal: to prevent Lula from getting elected again in order to, one more time, deliver the economic, political, and social accomplishments the Brazilian people need to increasingly stand ever more proud and sovereign. A warning is in order: there is no evidence of any wrongdoing committed by Lula in these lawsuits. And there is no evidence because there was no wrongdoing whatsoever! In the meantime, evidence of his innocence is ignored and dismissed. No one has ever been more fully investigated in all these years. No one has ever been so fully exposed and had their lives more thoroughly probed than Lula. Yet they could find nothing. No foreign account, no concealed assets. Nothing more than partisan convictions, unsubstantiated theories, arbitrary hypotheses, and intense political dispute justify and base the lawsuits against him. At a juncture when, in Brazil, conservative politicians are acquitted and preserved and criminals are released to spend their millions abroad, despite substantive incriminating evidence, convicting Lula, the most popular leader in our history, without a thread of evidence, amounts to dealing a fatal blow to Brazil’s justice and democracy. It is unacceptable that the justice system should proceed with an evidently political action to convict an innocent with the clear intention of interfering in the political dispute and to keep Lula from becoming a candidate. With this deliberate conduct, rife with extralegal and biased interests, and driven by countless transgressions of rights and guarantees enshrined in the legal order of the Democratic Rule of Law, the trials Lula is being submitted to offend the Brazilian constitutional system and international human rights treaties. By convicting Lula, they convict democracy and attempt to subjugate the will of the people. So much arbitrariness has been inflicted on Lula throughout these tortuous inquests and processes, it suffices to mention the unlawful and shameful operation that took him into custody in March 2016 or the ridiculed public Power Point presentation riddled with assumptions, image montages, and sound bites, with the evident purpose of embarrassing the former president and submitting him to public humiliation, clearly offending the fundamental principles of the dignity of the human person. Another extremely serious fact was the leaking by justice itself of recorded conversations between former President Lula and the then President Dilma Rousseff, whose illegality was ultimately acknowledged by the Brazilian Federal Supreme Court (STF) itself, upon whom it is incumbent to safeguard the Constitution. So far, however, the STF’s ruling has not led to the punishment or removal of the suspected judge, who shows no impartiality to try President Lula. Moreover, among other demonstrations of the persecution Lula is being submitted to is the arbitrary decision by another judge prohibiting, without any plausible reason, the activities of the Lula Institute, without there even being any petition filed thereto by the public attorney’s office, just for the sake of public exposure and humiliation. So outrageous was the decision that it was rapidly overthrown by a higher court. Still, it is revealing of the diversified mosaic of measures that are being taken by part of the judiciary against former President Lula, with the sole purpose of embarrassing him. Against Lula was adopted the so-called “criminal law of the enemy”, the judicial policy of previously identifying and fully criminalizing a person, regardless and even before the existence of a crime. In relation to Lula, they act like the “referee who doesn’t want to lose the game”, in the words of renowned Italian lawyer Luigi Ferrajoli, in a public analysis held last April 4, in Parliament in Rome. Everyone in Brazil knows that the judicial persecution against Lula, actually lawfare, has been part of the Brazilian coup d’état’s political agenda, since long before any legal action began. It is imperative to understand that the actions against former President Lula are being conducted by prosecutors and judges who have made a clearly ideological and partisan option, publicly expressed on social media. These prosecutors and judges have allied themselves with the conservative media, dominated by a small oligarchy of powerful families, with the political aim of persecuting and humiliating former President Lula and the Brazilian left as a whole. For this reason, these prosecutors and judges have adopted the criminal tactic of producing selective leaks of the investigations – a clear affront to the Brazilian law – to disseminate their absurd theories that Lula would be the “commander” of a sweeping corruption scheme. This dirty tactic, typical of authoritarian regimes, seeks public conviction in disregard for the due process of law and the principle of the presumption of innocence. It is also for this reason that this arm of the Brazilian judiciary system adopted the tactic of abusively using pre-trial detention as a form of psychological torture to force plea bargainers to depose against the former president, which is not only an affront to the Constitution, but also to international human rights treaties. Everyone knows, in Brazil, that the chance that a defendant will be released or get a shorter sentence increases exponentially by accusing Lula. There is, therefore, clear political selectiveness on the part of the Brazilian judiciary system. While politicians with ties to Brazil’s traditional oligarchies are protected or released, even in face of substantive evidence like recordings and suitcases full of illegal cash, Lula is convicted in the absence of any evidence. It is worth underscoring that former President Lula never sought any protection or privileges of any kind. He has never refused to appear in court. He never purported to be above the law. Lula is not above the law, but he cannot be denied the law, which disposes that everyone is entitled to a fair trial. Unfortunately, it is sad to verify that Lula was not given a fair trial. Far from that. He was prejudged and convicted by an oligarchic and venal media and by judges and prosecutors who are modern Savonarolas. This media-hyped pre-conviction had to be ratified by a legal sentence, even if unfair, unconstitutional, and illegal. As former President Lula has said, the judge and the prosecutors have become prisoners of their own lies. Now, the appellate court that is to review Lula’s case, the 4th Region Federal Regional Court (TRF/4ª), has scheduled Lula’s trial for January 24, 2018, in record time in Brazilian history. This trial is going on in half the time required by the fastest trials ever held in that Court. It must be noted that Carlos Eduardo Thompson Flores Lenz, presiding justice of the TRF/4ª, stated, even before the case arrived at his court, that the ruling handed down by Judge Sérgio Moro that sentences former President Luiz Inácio Lula da Silva to nine and a half years’ imprisonment in the episode of the Guarujá (SP) triplex was “technically flawless”. Therefore, this is about playing a game with a stacked deck of cards, whose political aim is to prevent the candidacy of a great popular leader. Even the prosecution’s petition recognizes there is no substantial evidence against the former president, besides the deposition of a plea bargainer who has been sentenced to 2 years in prison and who knew he could be released or have his sentence shortened should he accuse Lula, as has become customary in processes involving judges and prosecutors who, as a rule, act in a clearly selective and partisan way and merely on the basis of conjectures and arbitrarily built probabilistic hypotheses. According to the Brazilian law, plea bargains are invalid in the absence of substantive evidence. Yet, given the paradoxical reasoning that prevails in these Kafkaesque processes against popular leaders, absence of evidence becomes proof of guilt. In these processes have also prevailed, as noted, the trampling of individual rights and guarantees, abuse of temporary arrests as an instrument of political torture to force plea bargains, unlawful pre-trial arrests, and all sorts of aggressions against the Brazilian Constitution and the international treaties on human rights. In the specific case of Lula’s conviction, it should also be added that not only was there no evidence of his culpability, but also that there was substantial evidence of his innocence, as the fact that Lula never enjoyed the use of the apartment that, in the delirious allegation by the accusation he had received as “bribe”, and that the construction company has always held ownership of the property. This would be the only case of metaphysical ownership of a physical asset. Nonetheless, substantive evidence of his innocence was ignored in the purely political trial the former president was submitted to. In face of this situation, Lula’s defense has already filed a petition with the United Nations Human Rights Committee. Acting in partnership with Geoffrey Robertson, a lawyer specializing in human rights in the international system, the defense rightly contends that the former president will not have any fair trials, in compliance with the due process of law and with ample right to defense, in the present political setting in Brazil, a country submitted to a coup d’état and exceptional measures. This coup d’état, perpetrated by what has been termed “the most dangerous gang in Brazil” against a president widely known to be honest (Dilma Rousseff), always had as its ultimate goal to destroy the Brazilian people’s social and economic achievements and to impose, in arbitrary and illegitimate fashion, an agenda rife with social setbacks and destruction of rights that would have never been approved in free and democratic elections. The Brazilian people know that the only “crimes” Lula committed were, among others, having lifted 42 million Brazilians into the middle class, having virtually eradicated poverty in Brazil, broadened educational opportunities for the poorest population, increased the minimum wage by more than 70%, enlarged healthcare services for needy Brazilians, reduced deforestation in the Amazon region, committed Brazil to the world fight against global warming, enabled true fight against corruption in a country that had always tolerated it, affirmed the country’s independence and sovereignty, removed Brazil from the FAO Hunger Map, and in short, started the construction of a fairer and solidarity country. A Brazil for all. Thus, Lula is being persecuted for his virtues, his powerful symbolism as a popular leader dedicated to eliminating poverty and overcoming inequalities, which, in a crisis, clashes with the neoliberal and “austericide” imperatives of the coup-led government. Not for his alleged crimes. But we believe that Lula is also being persecuted for what he means to the world. Unquestionably, Lula has set up a foreign policy designed to build a pluralistic, truly multilateral world, in which the emerging countries may also enjoy the benefits of development and participate in the great international decisions. Lula has also played a decisive role in the introduction of the main social themes in the world agenda, in committing the emerging countries to key environmental issues, and in initiatives designed to reform multilateral institutions and control world finances. This way, Lula replicated, at the foreign level, the progressive policies he implemented domestically. Lula is a symbol of equality, social progress, and democratic multilateralism for the world. Lula represents the hope of overcoming neoliberalism’s concentration of income and wealth, promotion of poverty and inequality, rampant unemployment, exclusion, and injustice, and deeper division between the countries of the globe. Lula symbolizes, above all, the idea that another world is possible. For all of that, Brazil is willing to fight and combat this unfair persecution. 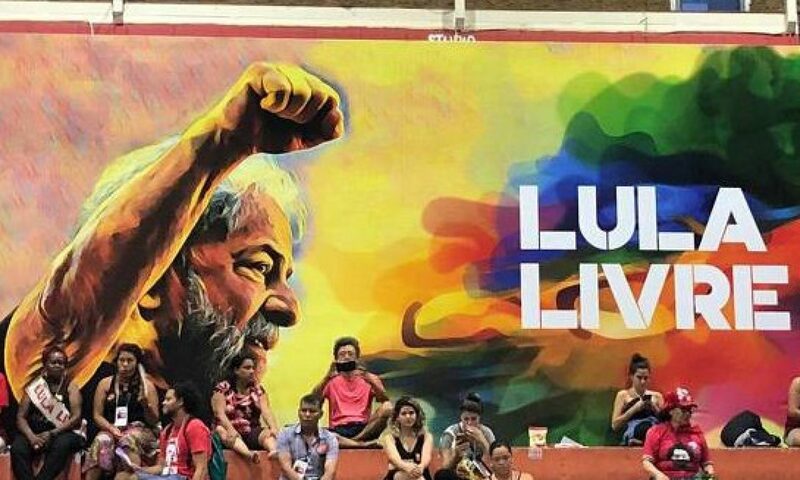 Lula represents everything the reactionary and antidemocratic oligarchy hates the most, for his personal struggle is intertwined with the collective struggle of the Brazilian people and of many oppressed peoples in the world. Lula is genuinely a creation of the Brazilian people. He is their face and their heart. Lula is in the son of the bricklayer who became a doctor. In the mother who can afford to feed her children today. In the waters that today irrigate the northeastern semi-arid outback. In the light for those who, in the 21st century, lived in darkness, without electric energy. Lula is in the Mercosur, the Unasul, the Eclac, the BRICS. Lula is in the G-20, in the United Nations’ Sustainable Development Goals (SDGs) and Millennium Development Goals (MDGs). Lula is in the solidarity with Africa. Lula’s example is in every international program designed to fight hunger and poverty. Lula is the hope of reconciliation for Brazil. Only direct elections with Lula’s participation will be able to overcome the country’s extremely serious political, economic, and institutional crisis. Incarcerating Lula means keeping Brazil in an insoluble crisis. It is worsening the conflicting setting the country is imprisoned in. And Lula is also a symbol in a world lacking world leaders truly committed to fighting the gaps between countries on this planet. Lula embodies the dream of equality and hope of a less asymmetrical world. A world oriented to satisfying the needs of the people, not dedicated to the maintenance of the privileges of the few who control globalized finances. This dream cannot be imprisoned, this hope cannot be incarcerated. We will react, we will fight back. Now, more than ever before, we will dedicate our strengths to acquit Lula. In every sphere and every court, in Brazil and abroad, we will denounce this scandalous injustice. This new coup against Brazilian democracy. We will denounce that, without Lula, the only leader capable of opposing the destructive agenda of the ongoing coup, the next Brazilian presidential election will be a big fraud. Without Lula, there will be no democracy in Brazil. Without Lula, the hopes of a better world dwindle. We are certain of victory. We are – with Lula and the people – on the right side of History!